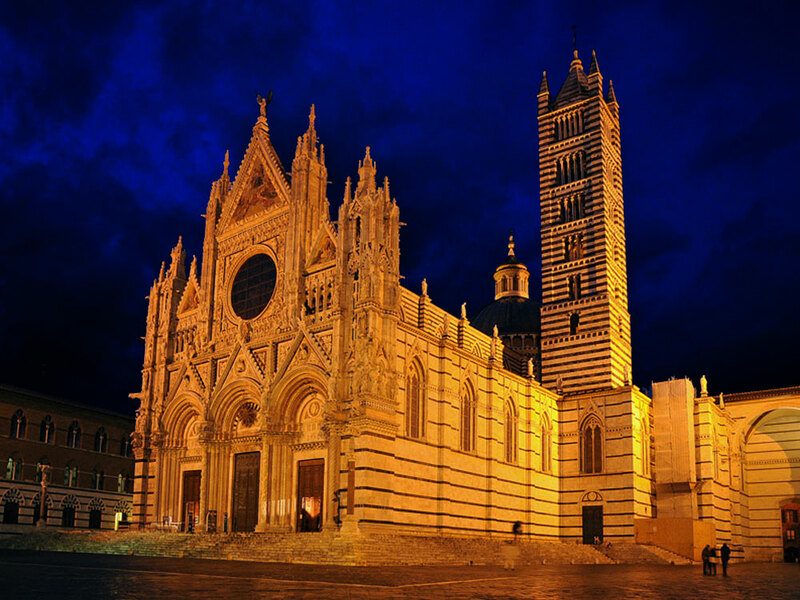 Piazza del Duomo is dominated by the imposing structure of Siena’s cathedral, dedicated to Santa Maria Assunta. The building stands over an existing church that in turn was built over a pagan temple dedicated to the goddess Minerva. 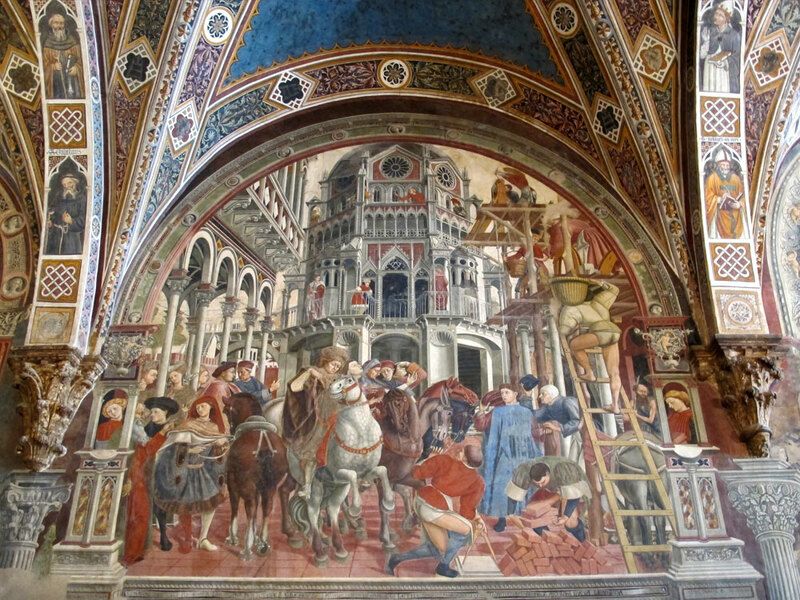 Construction of the existing Duomo started in 1200, with the main sections already completed by 1215. 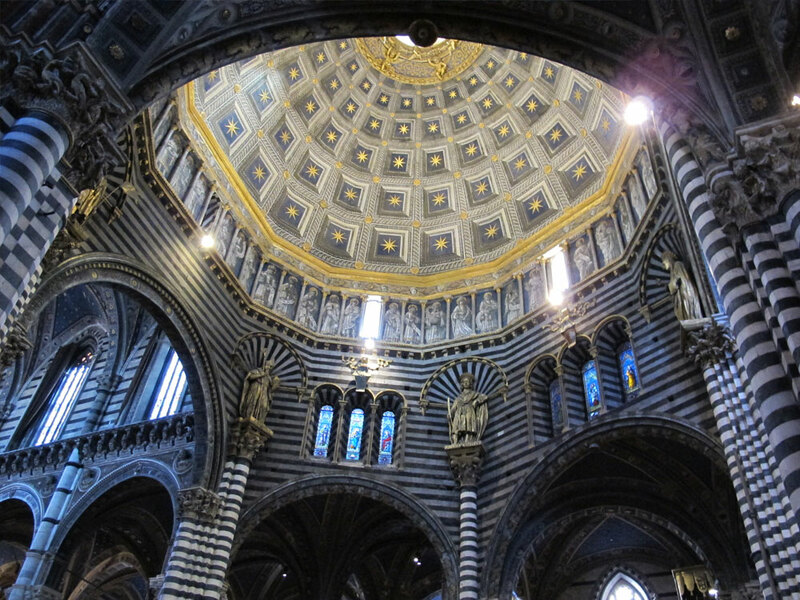 The dome was built between 1259 and 1264. 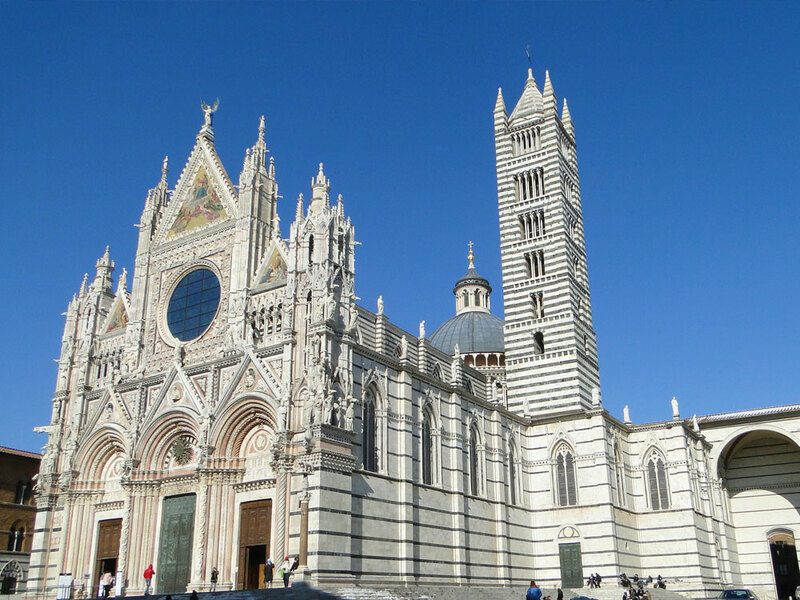 The Latin cross design of the church includes three naves and is entirely sheathed in strips of alternating black and white marble, a reference to the black and white colours of the coat of arms of the city of Siena. 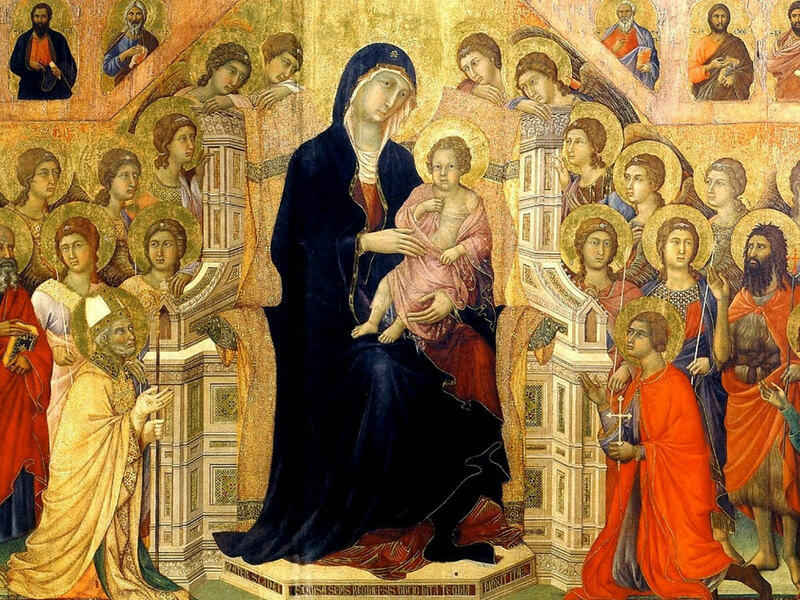 The lower section of the facade was built between 1284 and 1296, probably under the supervision of Giovanni Pisano. In 1317 work was started on the extension towards the area known today as the “Valle Piatta’. 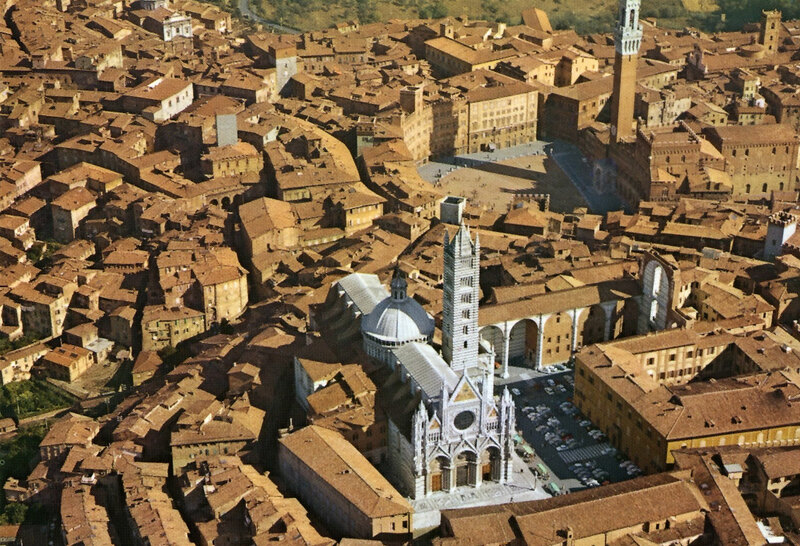 Despite this enlargement, the church was deemed insufficient for the needs of the city, which felt a strong need to compete against the vast cathedral of Santa Maria del Fiore being built in Florence at the time. Ambitious designs were therefore drawn up to build what should have been the largest cathedral in Europe. Construction of the so-called ‘Duomo Nuovo’ was started in 1339, under the direction of Lando di Pietro. 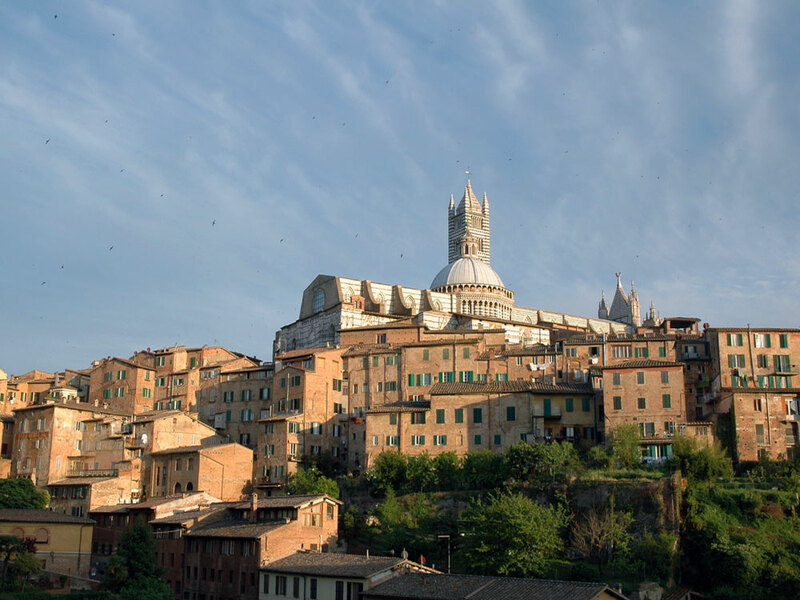 Proceedings soon ground to a halt, however, following the precarious conditions of the town’s coffers after the great plague that hit Siena in 1348. Coupled with political turmoil and basic faults in the design, the Senese were forced to abandon the project, of which there remains only the grandiose facciatone facade, and return to the original designs. 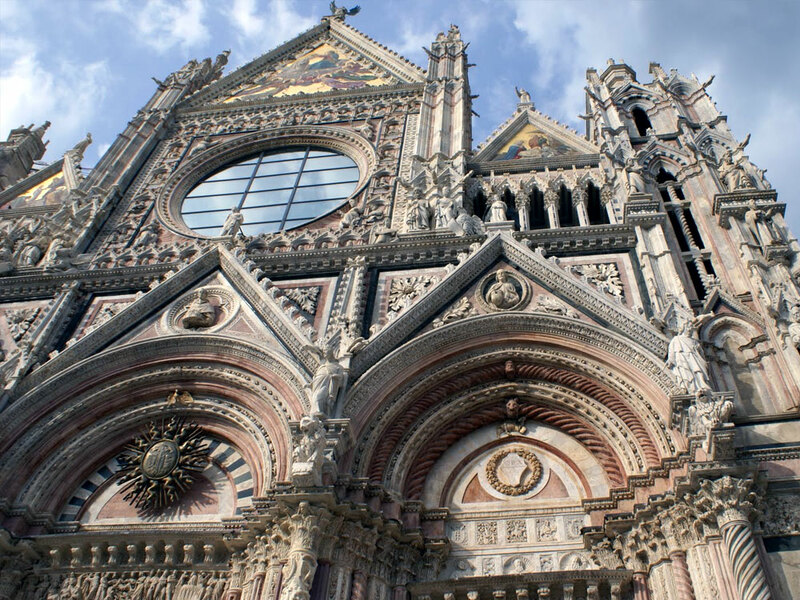 After 1376 Giovanni di Cecco supervised the completion of the facade, which is inspired by the Duomo of Orvieto. Its polychrome marble decoration contains a number of sculptures. The lower section is Gothic-Romanesque in design (by Giovanni Pisano), with three doors. The upper section is in late-gothic style and was designed by Giovanni di Cecco, with mosaics added to the cusps in the 19th century. The alternating white and black bell tower is Romanesque and rests on a previously existing tower. Its six orders of windows are crowned by an octagonal pyramid cusp with lateral pinnacles. The interior of the Duomo reflects the polychrome use of marble decorations present in the exterior and makes clever use of light from the outside to create a mysterious effect of shadows. 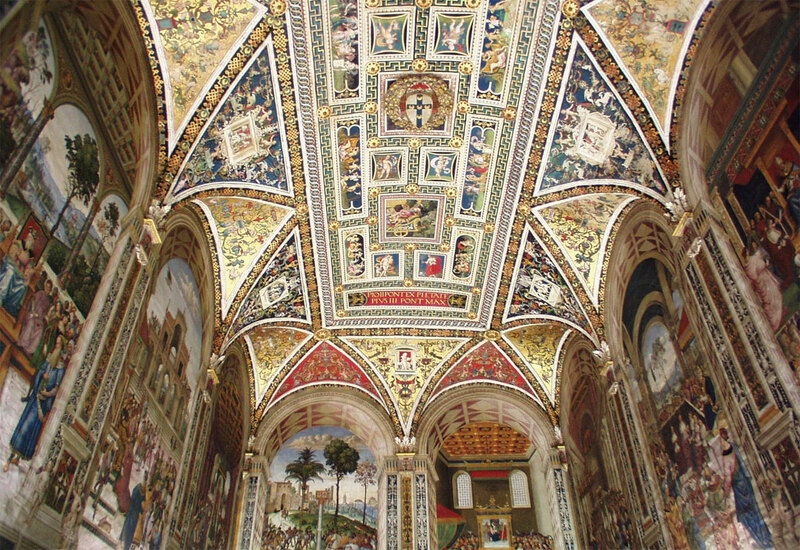 The vaulted ceiling painted in blue with golden stars was raised in the 14th century, so that the external walkway of the cupola appears partially covered. The arches and vaulting of the main nave are divided by a cornice that is supported by 172 16th century stucco busts of the Early Popes. Beneath these there are the busts of 36 Roman Emperors. 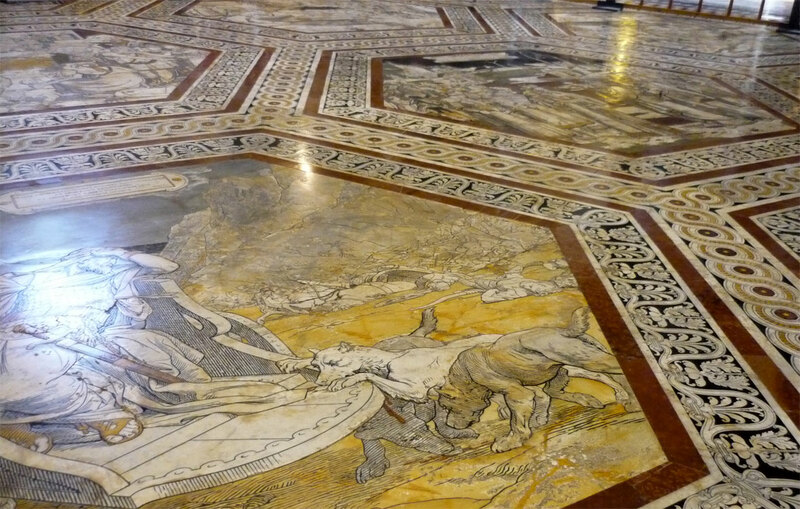 Between 1369 and 1547 the floor was completely inlaid in marble and, for conservation reasons, is usually covered by wooden boards near the dome and presbytery. 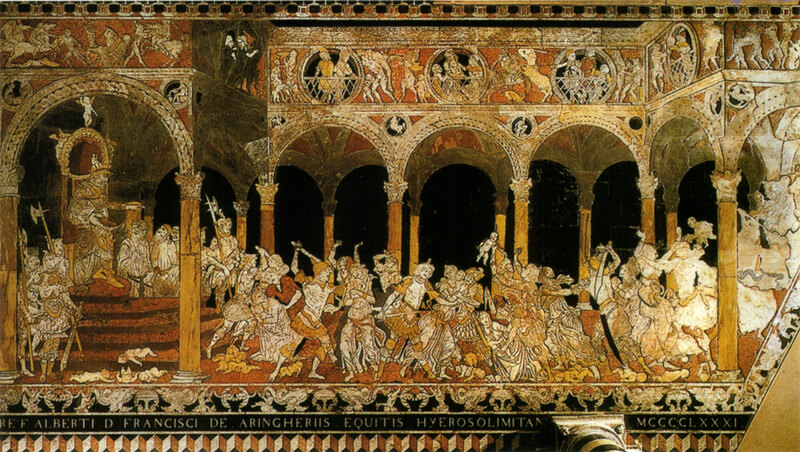 This area in fact contains 56 square slabs each depicting a scene inspired by salvation and completed by 40 different artists, almost all of whom were from Siena. Two holy water basins sculpted by Antonio Federighi in 1462-63 are placed next to the first two columns of the church. Six sided at its base, the cupola develops into twelve sides as it rises and is adorned with gilded statues of saints placed in the niches at its base. The asymmetrical canopy above is decorated with 42 figures of the patriarchs and prophets, painted at the end of the 15th century. In 1532 Baldassare Petruzzi completed the marble high altar, which is surmounted by a bronze tabernacle by Vecchietta (1467-1472). 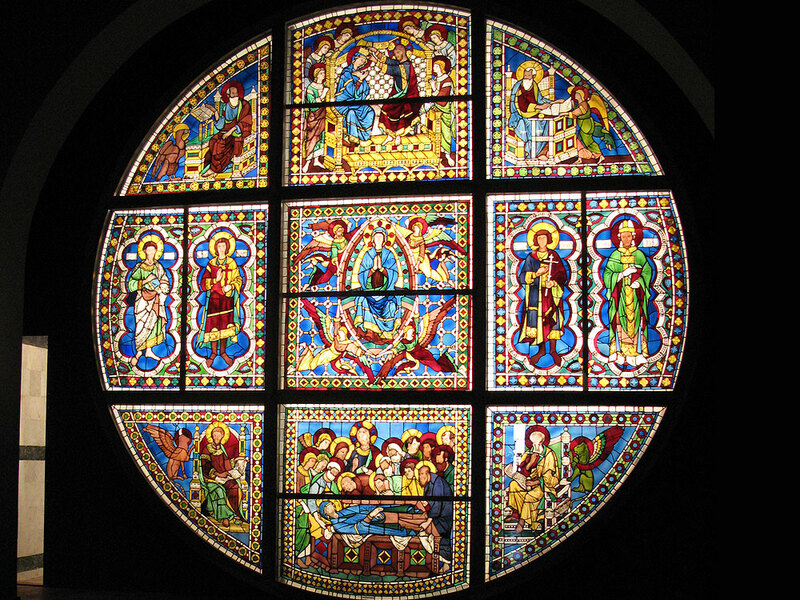 The vast stained glass window of the apse is by Duccio di Buoninsegna. 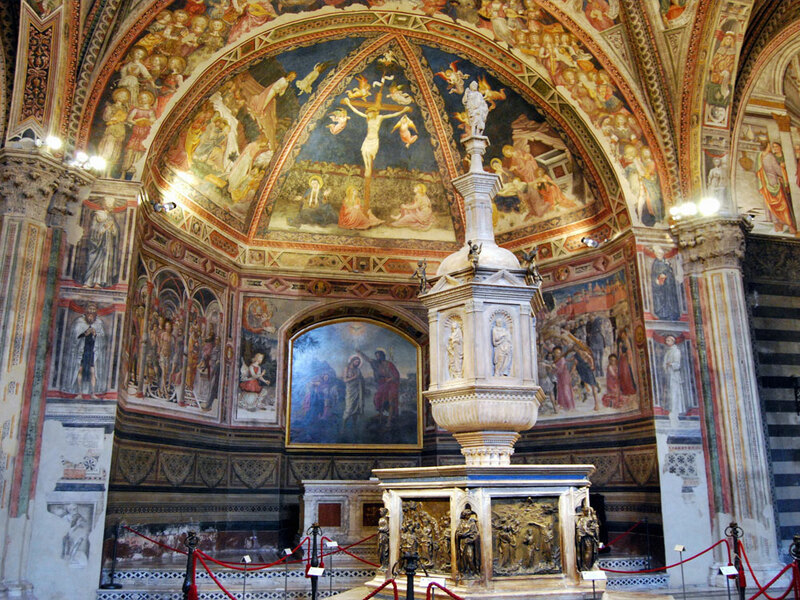 To the left there is a masterpiece of gothic sculpture: an altar by Nicola and Giovanni Pisano (1266-68). 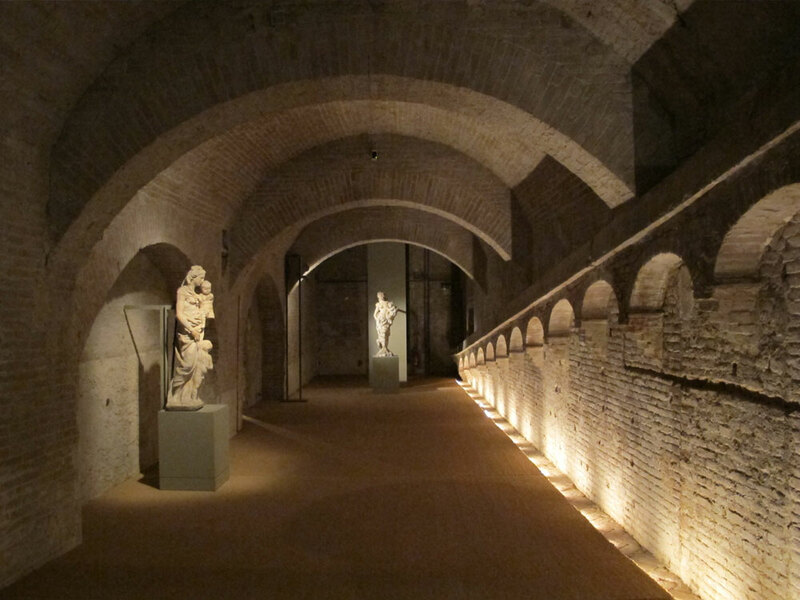 On the same side is the Chapel of St John the Baptist, with a statue of the saint completed by Donatello in 1457. Immediately after the chapel is the grand entrance to the Piccolomini Library, founded in 1495 by Cardinal Francesco Todeschini Piccolomini (later Pope Pius III) to house the library of his uncle, Pope Pius II. The family’s altar is also here, commissioned from Andrea Bregno at the beginning of the 16th century, with four sculptures by Michelangelo. The left hand nave contains the Chapel of the Madonna del Voto, or Chigi Chapel, commissioned by the Senese Pope Alexander VII from Bernini in 1661.